Some more amazing shapes in the sand. Thank you soooo much for putting "Mohawk" and "Curves" on the PP at the same time! Sublime and has magical quality. Also reminds me of Edward Weston. No question about a fav. Stunning on black, so far my favourite of the series! well this is another that deserves to be on the popular page. 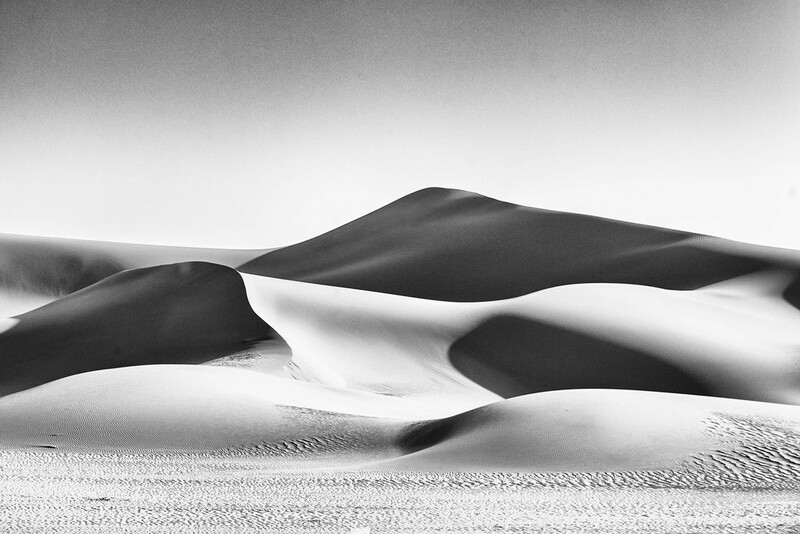 Just loving those dunes and the black and white edit. fav ! love these curves ! Oh woweeeeee, those curves look like they're alive, like a large (sea) ray. The light and shade's amazing too. I see what you mean -- the curvy lines that flow and overlap . . . this whole series is quite stunning! Brilliant, somehow it reminds me the Guggenheim Museum in Bilbao. @graemestevens Thank you very much, Mr. S. Did you finish building your new house? @allie912 Thank you so much! @jakes Thank you very much! @joysabin Too kind of you. Wow, Edward Weston... I'm humbled! @mona65 Too nice of you, Mona, thanks so much! @seattlite Thanks a lot, Gloria! @overalvandaan Thank you indeed, Saxa, glad you like it! @helenhall Thank you very much, Helen. I was so doubtful about the color/BnW choice... in the end, it is proving the right one! @cocobella Thank you very much, Corinne! @pistache Again, too kind of you, Clare! @bkbinthecity Thanks a lot, Brian! @golftragic Oh, they really behave like they're alive. Always changing shape under the wind. Thank you so very much! @tiffanyparadisphotography Thank you a lot! @jyokota Thank you, dear Junko. I very much appreciate your judgment! @yaorenliu Maybe Mr. Gehry was inspired by the curves of the dunes... Thank you very much! @bella_ss Thank you so much! @blueberry1222 Thank you a lot! Another simply brilliant composition from the desert. Great curves and lovely textures. @domenicododaro We haven't even started yet!!! It's driving me (more) insane. @taffy Thank you very much, Taffy! @graemestevens Oh nooo, I do understand you very well! It's so good but it's sand.... what has it to do with females? Fav anyways! Gorgeous. Contrast, curves, shapes, texture - you got it all! @yrhenwr The shape of the dunes in the foreground, right, remembered me the torso of a lying lady. Thanks for the fav again! @stray_shooter Thank you so much, Ron, much appreciated. @annied Thank you very much, Annie! @pusspup Thank you very much, also for the follow! @jocasta thank you, much appreciated! What a sensual scenery - beautiful! @kerosene Thank you, dear Caroline!